One of the most amazing things about the explosion of graphic novels in the current era is how many great non-fiction comics have come out. 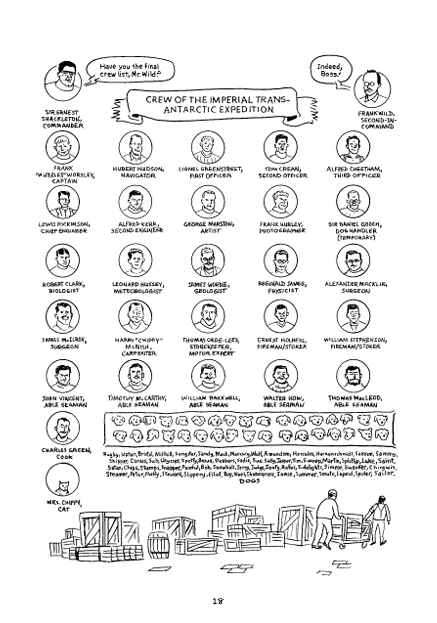 One might argue whether or not book publishers are too focused on “graphic memoir” these days, but if I can read more stories like this bizarre true-life story of Ernest Shackleton, Antarctic explorer, I don’t mind. The early 1900s was the “heroic age of Antarctic Exploration”, where daring men struggled to find out more about the ice-bound seventh continent. Shackleton’s third try involved a plan to walk across Antarctica, coast to coast via the south pole. It’s difficult to keep all the men straight, with so many of similar looks and character, but I do adore that he drew all the little dog heads, since they were such an important part of the mission (although it did not end well for them). Bertozzi’s use of detail throughout the book brings home the difficulty (and somewhat foolhardiness) and danger of this expedition, making it both real to the reader and entertaining. Shackleton’s determination to keep returning to an uninhabitable place that almost killed him comes across as rather pig-headed, but the historical English setting of his homeland provides a (perhaps superficial) explanation, what with the stiff upper lip determination of his people. His search for national pride and glory was a significant part of his motivation. The tasks needed to accomplish this are astounding. The men had to physically break a path for the ship to proceed, for example, and when they got stuck, they spent the winter camped on the ice (with a football game as a distraction and a bicycle trip past penguins). When the ice destroyed one of the ships, they hiked, considering carefully every possession they had to carry, before settling into a new camp. The trip began at the beginning of August, 1914, and concluded with an appeal for rescue in May, 1916, after a daring small boat trip to a whaling station. Breaking ice and unpredictable currents put them at the mercy of wind and water forces much greater than any man. Yet the crew’s attitude, full of determination and good humor in the face of life-threatening adversity, is the kind of strength not much celebrated any more. Amazingly, no human life was lost (although the same can’t be said for everyone’s toes). Shackleton: Antarctic Odyssey is a fascinating book about an adventure most readers know nothing about. Bertozzi takes just the right tone, light and straightforward. I’m not sure I respect Shackleton’s sincerity, but reading this in a comfy, warm home was a lot more enjoyable than being there.